Because Mondays Need Pizza | Small, but valuable. Yesterday included a job interview, today included a doctor’s appointment (no big deal, just not my favorite), and last night needed to include pizza. I mean, it really needed pizza. It needed cheese and comfort and celebration and carbs. I’m trying to be healthy though, and we did have homemade pizza last week. That meant coming up with something else for dinner last night. Something else that fit into my three main recipe metrics for the night: 1) healthy, 2) cheap, 3) made me feel like pizza. I’m pretty proud of what came out of my brainstorming, actually. We had delicious stuffed sweet potatoes for dinner–stuffed with ground turkey (and spice and everything nice), black beans, homemade guacamole, green onions, and a tiny bit of Monterey Jack cheese. And you know what? It felt just like pizza. It was bready and absolutely delicious. It had lots of flavor, thanks to the guacamole, and I would eat it again tomorrow. 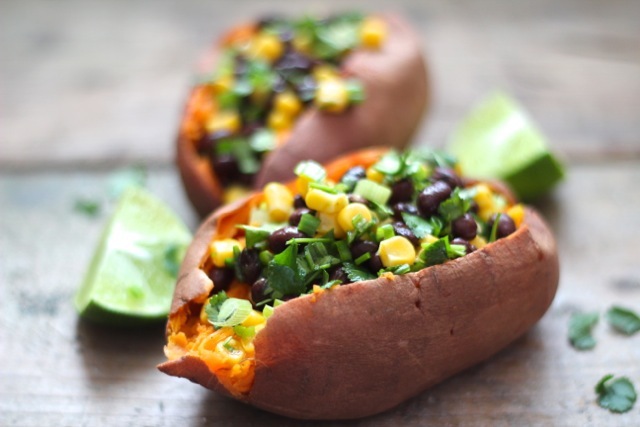 Wrap your sweet potatoes individually in tin foil after washing them off and piercing them a few times with a fork. Preheat oven to 425 degrees. When it’s ready to go, pop the potatoes in and bake them for 45-50 minutes. Heat a large skillet and cook the ground turkey until it’s cooked through, adding spices sometime during that process. After the turkey is browned nicely, add the black beans. Keep that mixture warm. Mix up your guacamole. You can add the ingredients to a small mixing bowl in any order–avocado, tomato, onion, lime (garlic would be a good addition, too). Chop your green onions and set them aside. Grate whatever cheese you want to throw on top. Then you can just pile the innards as high as possible on the baked sweet potatoes. I sliced the baked potatoes in half, opened them up, and added turkey/black beans, then cheese (so it would melt), guacamole, and green onions. Order would be less important if it weren’t for the cheese melting thing. And the visual appeal thing. The guac and green onions were really pretty on top. The beauty of this recipe is that you could add just about anything. You could do turkey and frozen corn and different spices and cheese. You could use ground beef or salsa or whatever you want to try. You could make Italian stuffed sweet potatoes instead of Southwestern stuffed sweet potatoes. The world is your oyster. And let me remind you that yes, this completely satisfied my emotional need for pizza. That’s a pretty big statement. On the non-food front, our living room is still kind of like a construction zone, which is fine. There are dishes to wash, clean laundry to fold, plants to water, and the world continues to turn. It is! 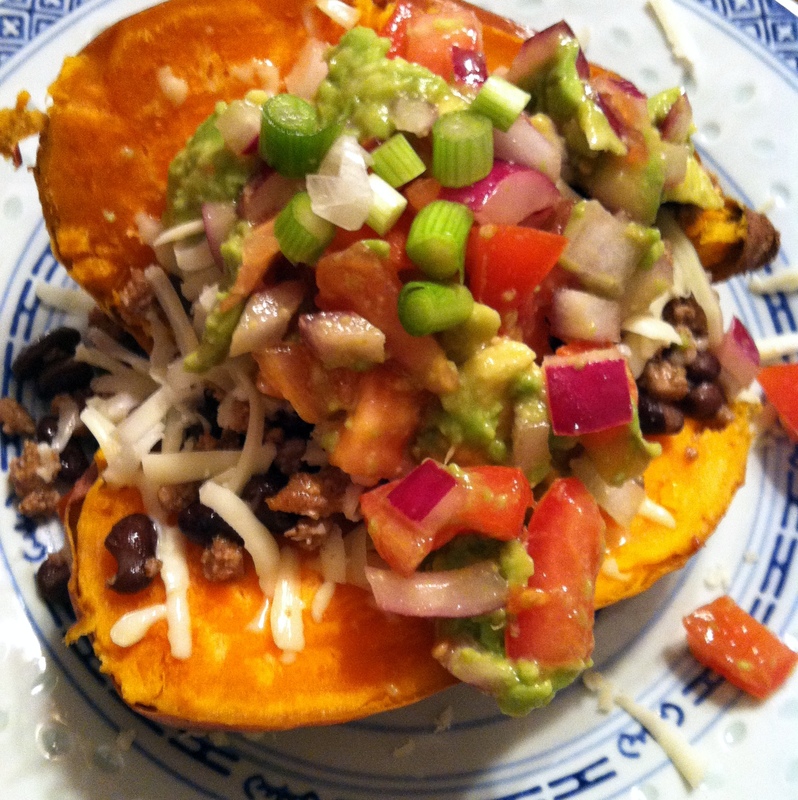 I had my doubts about the sweet potato/Southwestern flavor combo, but it worked really well. Pingback: Sunday Meal Planning | Small, but valuable.